What makes us special? We like to think it starts with service. We believe in providing the highest quality products and employing the most professionally trained staff. We also believe in great deals. We carry only quality products when it comes to garage doors including but not limited to Chamberlain, Craftsman, Genie, Liftmaster, Marantec, and Sears..
What Do Our Routine Checks Involve? One service that is very important here is regular lubrication. By keeping the tracks and springs lubricated, you can minimize wear and tear of the various parts and keep them running for longer. Another thing that can keep your garage door in proper working order is making adjustments over time. If your tracks are in danger of becoming wonky, we can re-align them and ensure this doesn't happen. Our technicians will come out to your home and ensure you do not already have any significant issues that could make your garage door malfunction. 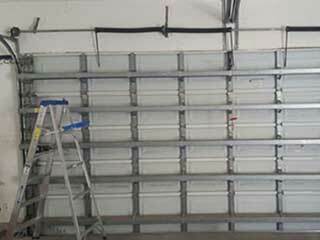 Honestly, sometimes a simple adjustment is all it takes to get your garage door back into shape. We definitely recommend a door inspection if you are about to or have just bought a new home to make sure that your garage door is in proper, safe working order. At Garage Door Repair Beverly Hills we want you to know that we care about your garage door. We don't just want to be there for the big repair jobs. Allow us to help you prevent big problems from occurring with our preventative maintenance and advice.